Danielle and Sam have a connection that spans across state lines. When the two originally met, they lived hours away from each other, but that did not stop their growing feelings for each other. The two grew in their faith together and their love led them to their wedding day at The Grove in Cedar Grove, New Jersey. Before the ceremony, Danielle and Sam each read a heartfelt letter from the other. Each person highlighted just how much the other meant to them, and knew they had a bright future together. 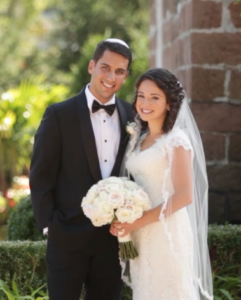 Their two year relationship brought them to, as Danielle said in her letter, “officially the best day ever.” As they stood at the chuppah in ceremony, Danielle and Sam started their new lives together. After the ceremony, the couple ecstatically celebrated with their family. Our team at Allure Films was lucky to capture all of their dancing, singing, and celebrating. Throughout the entire night, the couple could not stop smiling. Our friends from Philip Gabriel Photography also photographed the day’s festivities. We were honored to be a part of this wonderful occasion. Mazel Tov Danielle and Sam! We wish you many more happy years together.